So you have finally found your dream job in Machine Learning but are wondering how to crack the Machine Learning interview and what could be the probable 2019 Machine Learning interview questions. Every interview is different and the scope of a job is different too. Keeping this in mind we have designed the most common Machine Learning Interview Questions and Answers to help you get success in your interview. This first part covers basic Machine Learning Interview Questions And Answers. 1. What do you understand by Machine Learning? Machine learning is an application of artificial intelligence that provides systems the ability to automatically learn and improve from experience without being explicitly programmed. Machine learning focuses on the development of computer programs that can access data and use it learn for themselves. 2.Give an example that explains Machine Leaning in industry. Robots are replacing humans in many areas. It is because robots are programmed such that they can perform the task based on data they gather from sensors. They learn from the data and behaves intelligently. Let us move to the next Machine Learning Interview Questions. 3. What are the different Algorithm techniques in Machine Learning? 4. What is the difference between supervised and unsupervised machine learning? This is the basic Machine Learning Interview Questions asked in an interview. A Supervised learning is a process where it requires training labeled data While Unsupervised learning it doesn’t require data labeling. 5. What is the function of Unsupervised Learning? 6. What is the function of Supervised Learning? 7. What are the advantages of Naive Bayes? 8. What are the disadvantages of Naive Bayes? 9. Why is naive Bayes so naive? Naive Bayes is so naive because it assumes that all of the features in a dataset are equally important and independent. 10. What is Overfitting in Machine Learning? This is the popular Machine Learning Interview Questions asked in an interview. Overfitting in Machine Learning is defined as when a statistical model describes random error or noise instead of the underlying relationship or when a model is excessively complex. 11. What are the conditions when Overfitting happens? One of the important reason and possibility of overfitting is because the criteria used for training the model is not the same as the criteria used to judge the efficacy of a model. 12. How can you avoid overfitting? 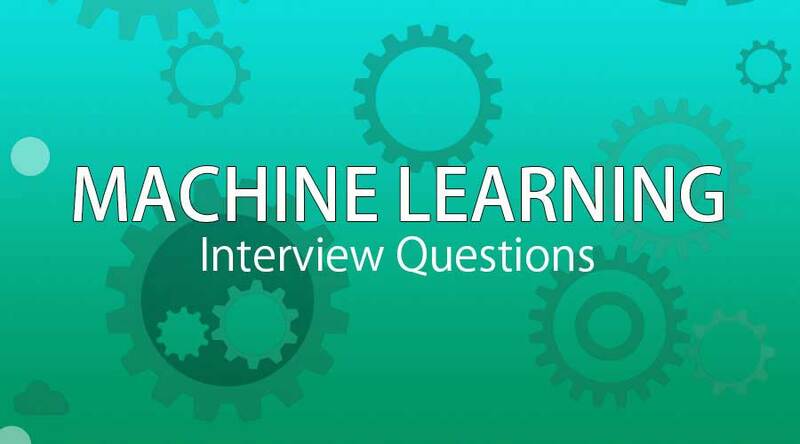 Let us now have a look at the advanced Machine Learning Interview Questions. 13. What are the five popular algorithms for Machine Learning? 14. What are the different use cases where machine learning algorithms can be used? 15. What are parametric models and Non-Parametric models? Parametric models are those with a finite number of parameters and to predict new data, you only need to know the parameters of the model. Non Parametric models are those with an unbounded number of parameters, allowing for more flexibility and to predict new data, you need to know the parameters of the model and the state of the data that has been observed. 16 .What are the three stages to build the hypotheses or model in machine learning? 17. What is Inductive Logic Programming in Machine Learning (ILP)? 18. What is the difference between classification and regression? • Classification is about identifying group membership while regression technique involves predicting a response. 19. What are the difference between inductive machine learning and deductive machine learning? machine learning where the model learns by examples from a set of observed instances to draw a generalized conclusion whereas in deductive learning the model first draws the conclusion and then the conclusion is drawn. 20. What are the advantages decision trees? 21. What are the disadvantages of decision trees? Decision trees are prone to be overfit. However, this can be addressed by ensemble methods like random forests or boosted trees. 22. What are the advantages of neural networks? This is the advanced Machine Learning Interview Questions asked in an interview. Neural networks have led to performance breakthroughs for unstructured datasets such as images, audio, and video. Their incredible flexibility allows them to learn patterns that no other Machine Learning algorithm can learn. 23. What are the disadvantages of neural networks? Neural Network requires a large amount of training data to converge. It’s also difficult to pick the right architecture, and the internal “hidden” layers are incomprehensible. 24. What is the difference between L1 and L2 regularization? • L1 is the first-moment norm |x1-x2| that is simply the absolute dıstance between two points where L2 is second-moment norm corresponding to Euclidean Distance that is |x1-x2|^2. It is because less sample of data. If sample value is small or low – over-fitting will occur. If quantity of data increases – sampling will increase. It means model will work better and we will avoid over-fitting.